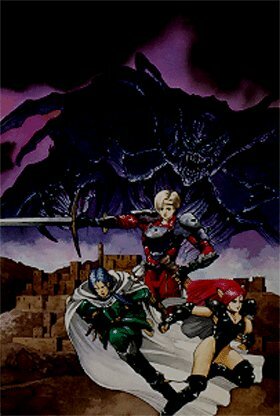 This is a little dark, but this art is the copy of the Phantasy Star IV Japan cover art included on the Saturn Phantasy Star Collection. Dark Force is rather hard to make out here., though Rika and Rune come through okay. I wish the Collection had a better quality sample of this. You may view the gallery page for Phantasy Star IV Front Cover. Chaz: Onward, Rune and Rika! Rune: Chaz, you are nowhere near leadership material. At all. Rune: That's the Elsydeon, Rika. Chaz: Hey, Rika, not that I'm complaining or anything, but what's with the skimpy leather getup? Rune: I know, Chaz. Did Seed dress you based on our lingerie catalogs or something? Rika: Did you complain about Nei's catsuit in Phantasy Star II? Chaz: I wasn't even born in the thirteenth century! How would I know?! Rika: Did you complain about Mieu having basically a skimpy onepiece in Phantasy Star III!? Chaz: Who the hell's Mieu? Rune: Did Phantasy Star III happen yet? Rika: And did you complain about Alisa Landale wearing a short skirt in Phantasy Star I? Rika: So why complain about what I'm wearing?! Chaz: Umm... (looks behind him) Big Dark Force behind us! Run! Well Rune looks cool in that armor but Chaz kinda reminds me a girl. I wonder if the artist who drew Alucard from SOTN drew Chaz. Overall it's an awesome pic. I've seen this image before. And for some reason, I just don't like it very much. Maybe it's just TOO dark for the game. Good pic but they made Chaz look kinda like a girl. This could have been an awesome image if it were not so dark and for a few other things. Such as, I agree with Darkil's post above, Chaz looks like a girl here. Just plain weird!! This picture is beautiful ! True that it's a bit Dark but it's a success !